Marcel Proust is the official poster boy for odor-evoked memory. As I’ve pointed out before, this is wrong on several levels. First of all, the madeleine episode in Swann’s Way doesn’t describe the magical experience most of us associate with smell memory, namely a vivid, detailed, and instantaneous recollection of the past. Instead, Proust’s narrator struggles to capture a vague emotion and takes several minutes to locate it in time and place. Secondly, Proust was not the first writer to describe the phenomenon of odor-evoked memory. It was, as I showed in my book, a common theme in American (and French) literature for many decades before the publication of Swann’s Way. 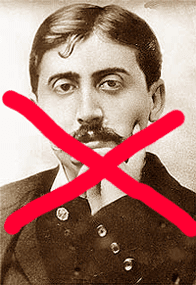 Finally, despite Jonah Lehrer’s fanciful spin, Proust was not a neuroscientist. The notion that he uncovered “an essential truth about the mind that science is only now rediscovering” is lot of baloney. Here’s another reason why: a scientific paper published in 1896—thirteen years before Proust’s novel appeared. The paper appeared in German in the Journal for the Psychology and Physiology of the Sense Organs. The author was Dr. Fr. Thomas of Ohrdruf, Germany. From what I can gather, Thomas was a priest with a doctorate in natural science—his specialty was the entomology of mite galls. In the spring of 1861 I was a student in Berlin. My daily route to the University took me along Artilleriestrasse over the Eberts Bridge. One day in the late fall of 1861, as I crossed the bridge fully immersed in thought, there suddenly appeared before me the Hüttenthal Valley near Königstein in the mountains of Saxony, where I had lived for a long time many years earlier, so lifelike in front of my eyes, that I could not understand how the direction of my thoughts could have been changed all at once. Near the bridge was berthed a Bohemian fruit boat, whose owner had his wares for sale in tubs hung on the railing of the bridge, while the boat itself served as a floating supply cellar and living space for its occupant. The Bohemian had brought brown coal with him as cheap heating fuel. The smell of the smoke from this coal, that had also been commonly used in Hüttenthal, had called up/awakened the memory picture to me. In Gotha and Jena, where I had also lived before 1861, this heating material was not used. To me it was the same smoke smell that had been new to me in the Saxony mountains, and so become an integral part of the total picture of that new world for me, and it was able three years later to call forth this picture again. Although it appeared in a scientific journal, this account is quite literary and quite “Proustian”: a narrator is initially baffled by the sudden appearance of a forgotten scene; with an effort he eventually recognizes that his memory was triggered by a smell. Unlike Proust, Dr. Fr. Thomas really was a neuroscientist—and not a bad memoirist either. His paper is another reason to take Proust off the pedestal and acknowledge that science nailed odor memory without the help of any novelist.